The Bergkamps are the first ever husband and wife to receive the hall of fame honor. Each inductee was recognized with a commemorative plaque. 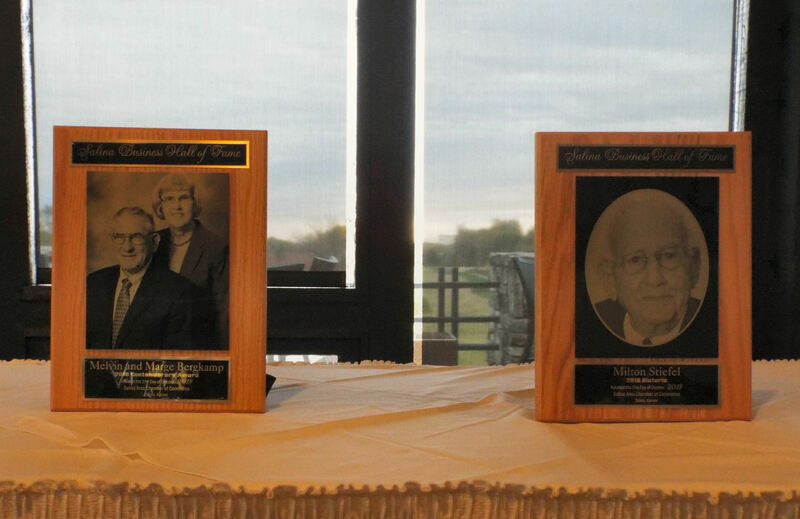 In addition, plaques honoring each inductee will be displayed at the Chamber office, 120 W. Ash. A biography of each inductee will be printed and distributed at the luncheon. Kansas Lieutenant Governor Tracey Mann was the featured speaker at the luncheon event. The Salina Business Hall of Fame was established by the Salina Area Chamber of Commerce in 2005. Its purpose is to recognize and honor Salina business leaders, both past and present, who have made extraordinary contributions to Salina, earned the respect of the local community and called attention to the Free Enterprise system and its value to our country and citizens in shaping Salina’s way of life. Past inductees include: (Pioneer) Henry David Lee, Alexander Campbell, Oscar Seitz and Winfield Watson, Benjamin Aaron Litowich; William R. Geis, William A. Phillips, Thomas Watson Roach, Charles R. Underwood, Frank Hageman, Heerman H. Sudendorf, and Arthur M. Claflin (Historic) Ward A. Marshall, William Henry Graves, John J. Vanier, M.J. Kennedy, Milton Morrison, Charles W. Shaver, C. William “Bill” Exline, Murray Wilson, Ralph E. Reitz, S. Dean Evans, Sr., Whitley Austin, Ben Sellers, George L. Frisbie, Verla Nesbitt Joscelyn, Baalis Kyger Smoot, Robert J. Laubengayer, and Dan Bolen (Contemporary) Alfred P.G. Schwan, Charlie Walker, Roy Applequist, Lee Young, Paul E. Junk, Jack Vanier, James R. Allen, Richard E. Brown, Karl Stutterheim, Mike Berkley, Charles E. Stevens, Jr., Thomas Pestinger, Sidney A. Reitz, and Timothy M. Rogers.